Bad Breath is NOT normal - it is a sign of DISEASE! We may joke about our pets' doggy or kitty breath when they give us kisses, but it's really not a laughing matter. Pets suffer from the same dental conditions that humans do: gum disease, cavities, abscesses. Regular dental care is an important part of your pet's health. Neglected teeth and gums can cause severe pain and develop infection that can spread through the bloodstream to damage other organs. A thorough check of your pet's mouth is a part of every exam we give. If anything irregular is found, we'll make treatment recommendations which can range from regular at-home brushing and use of oral rinses to a complete dental scaling and polishing under anesthesia. Advanced dental disease may require extractions. If your pet shows any of these symptoms, please make an appointment for an oral exam. We will provide you with a treatment plan as well an estimate of the cost. Pre-anesthetic bloodwork: This includes one or more tests that detect major organ and metabolic abnormalities which may complicate the anesthetic procedure. Digital dental X-rays: With the roots set deeply into the bone and covered by gum and other tissues, it is often only through the use of x-rays we can properly assess dental health. Intravenous catheter and/or fluid therapy: The IV catheter allows access for injectable drugs. Fluid therapy helps to maintain blood pressure during the procedure andavoid post-operative dehydration. Anesthesia: Inhalant gas anesthesia is safer and more adjustable based on your pet's needs. Anesthetic monitoring: This includes monitoring of the heart, respiration and blood pressure. Dental scaling: This process removes the calculus and plaque from the tooth surface and below the gum line. Extraction: The health of each tooth is individually assessed, and any diseased tooth should be extracted. Dental polishing: Polishing provides a smooth tooth and delays the reattachment of plaque-causing bacteria. Antibiotics: If there is significant periodontal disease, antibiotics will be administered before, during and after the procedure. 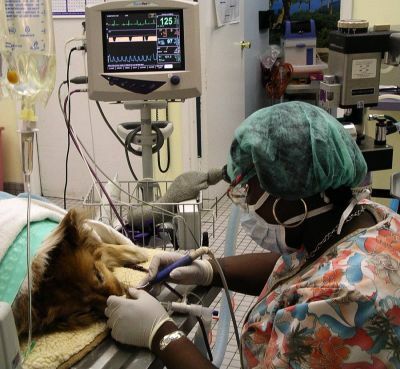 Pain management: Medication is tailored to the needs of your pet, and based on the procedures performed. So the next time you complain of your pet's bad breath, look into their mouth and call us for an examination. Let's cure any problems and prevent more serious ones before they start, and discuss home care options to maintain your pet's healthy teeth. Ask us about home dental care! We have numerous home dental care products here at the clinic to help you with your pet's dental care. These include toothbrushes and toothpastes specially designed for dogs or cats, Greenies Dental Treats, dental sprays, and prescription dental diets.